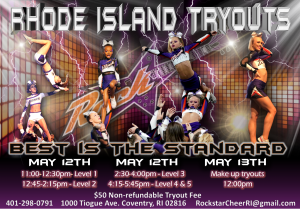 MANDATORYTUMBLING REQUIRMENTS TO DECIDE WHICH TRYOUT TO ATTEND. LEVEL 1: Must have: Cartwheel and round off. Back walkover with great execution is preferred. LEVEL 2: Must have: 1) A back walkover back handspring; 2) Roundoff 2 back handsprings; 3) A specialty running pass ending in 2 back handsprings. All must have great execution. LEVEL 3: Must have: 1) Standing 3 back handsprings; 2) Toe touch 2 back handsprings; 3) Round off back tuck; 4) A specialty running pass ending in a back tuck. All must have great execution. LEVEL 4: Must have: 1) Standing back tuck; 2) Standing 2 back handsprings to back tuck; 3) A specialty running pass ending in Layout. All must have great execution.